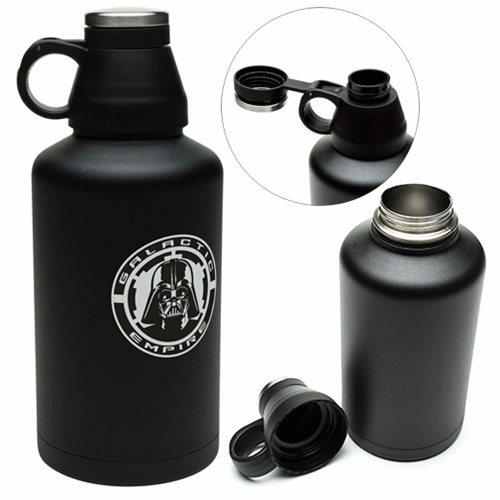 Keep your drinks warm or cold with the Star Wars Darth Vader 64 oz. Stainless Steel Growler! This stainless steel growler is made with double-walled vacuum insulation, a screw off cup, and a screw off lid. Whether you are at Mos Eisley cantina or at home, take your drinks to go with the Star Wars Darth Vader 64 oz. Stainless Steel Growler. Growler measures 9 1/4-inches tall, is dishwasher-safe, and BPA free. Do not microwave. Ages 15 and up.